“George Mitchell’s vision for developing The Woodlands as a major master-planned community continues to be the guiding light for success. 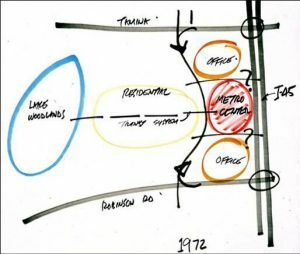 But in the early 1970’s the ideas and concepts behind The Woodlands were so new they required time and effort of develop so the learning process required adjustment. Mitchell and his team worked over the years to more clearly define key elements of the vision and to establish the building blocks upon which its success was achieved. The vision can be fairly stated today as ‘a real hometown for people and companies where one can live, work, play, shop and learn.’ Its building blocks listed below are implemented through a relationship of trust with regulatory agencies and the active participation by individuals and companies who chose to locate here and contribute to community quality.” Read More here The Vision and Its Building Blocks.